1. Drink your water - as simple as this is, this can't be iterated enough. Last year I justified coffee and smoothies as my water intake, and I feel like my body/skin definitely paid for that. This year I am holding myself accountable by first drinking water and then other types of liquids if necessary (this way, I'm also hoping to decrease my coffee/fructose/sugar intake-- win/win). Here's a tip-- track your H2O consumption in your journal or planner, and make it easy to track by utilizing a sole water canteen to drink from. Knowing that my canteen holds about 22 oz, I would need to take in three full pours a day to amount to 64 oz (the recommended eight glasses of water/day). 2. Have a skincare routine for night and morning! I'm no stranger to stringent regimens in the PM, but I've recently incorporated some key products for AM application, too. I started using OLAY's Luminous Whip face moisturizer in the mornings and it's proven to be really helpful in more ways than one. True to its name, it's super lightweight, it absorbs into the skin very quickly, and it feels cool and sort of hydrating all at once. It also seems to minimize pores by mattifying the skin, which makes for an excellent foundation for makeup (though in these photos I'm not wearing any makeup, just the cream--it's pretty amazing). 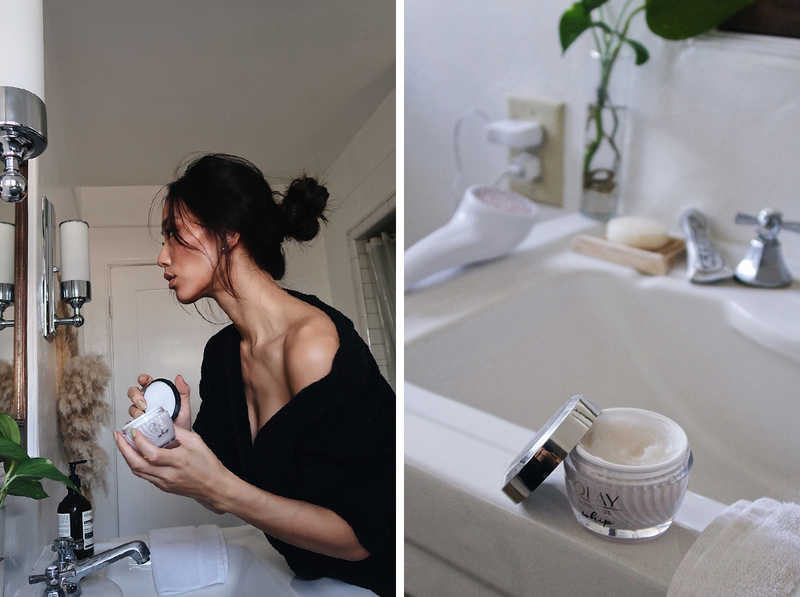 So I feel it's ideal for even the busiest of mornings, with it taking care of the mattifying, the moisturizing, the priming, and the pore-reducing needs. Better yet, I noticed when reading the label that one of its main ingredients is niacinamide (more commonly known as vitamin B3) and that's important because it boosts collagen production and helps improve our lipid barriers so that our skin is more apt to retain moisture (which is maybe the most concerning for me as I grow older). The whipped formula also has 'Active Rush Technology', which instantly absorbs moisture into the skin for all-day hydration and instant skin brightening. 3. Try adding skincare tools to your regimen. Recently I started using an LED device for light therapy and a facial roller to tighten and de-puff. Infrared light is believed to stimulate proteins like collagen and elastin, and increase circulation (things we start to lack as we grow older). So far, my skin feels more taut after each use; pores and lines are minimized and my complexion just seems brighter and rejuvenated overall. I've found that when paired with an excellent cream, the results are even better and quickly achieved. 4. Practice mindfulness - in everything you do: exercise, nutrition, the amount of rest you get and conversely, your stress levels. Learning to be more aware of what your skin, body, and mind need and catering to that is a good step in feeling great comprehensively. Personally I get anxious and stressed out quite easily, and in realizing ways I could remedy that, I'm attempting to work out more, eat better food, and carve out time to meditate each night. Beauty is more than skin deep! Since the start of the new year I've been really drawn to good energy, new ideas, and great conversation; so please let me know of your unique self-care routine and tips and/or any new products you've found to be helpful to your wellbeing overall. If anyone else has tried the OLAY Luminous Whip, I'd also love to hear your thoughts!